Lady Crane to the Rescue! We pick up in Braavos with Lady Crane playing Cersei again and acting out Joffrey's death scene. We find out that the actress has indeed taken Arya's advice on how to play the scene. Lady Crane goes backstage following a huge ovation from the audience to find a seriously injured Arya. Lady Crane patches Arya up and again offers to take her with the company when it heads to Pentos. Arya declines, saying that no one would be safe with her around, which we'll see the absolute truth of toward the end of this episode. The Hound catches up to the rogue members of the Brotherhood Without Banners who slaughtered Brother Ray and his community in the previous episode. And the Hound's justice isn't pretty. In Meereen, Varys and Tyrion are about to part ways for the time being. It sounds like Varys is heading back to King's Landing, and when the two say goodbye, they genuinely look like they're going to miss each other. Qyburn informs Cersei that some of the Faith Militant have entered the Red Keep. Cersei, Qyburn, and Frankengregor encounter Lancel and some of his buddies outside. Lancel says that the High Septon, AKA the High Sparrow, has summoned her to the Great Sept of Baelor. Cersei refuses to go. Lancel orders her to order Frankengregor to stand down or there's going to be violence, and Cersei opts for Door #2, Violence. A truly stupid member of the Faith Militant tries to hack at Frankengregor and literally has his head ripped off for his efforts. Is Jaime's question to Brienne when they chat in Jaime's tent in the Lannister camp outside the walls of Riverrun. First, though, Bronn puts Pod in an affectionate headlock and comments to Pod that Brienne + Jaime could definitely happen. In the tent, Brienne reveals Sansa's plans to Jaime and proposes that if she can persuade the Blackfish to surrender Riverrun without bloodshed, Jaime will allow the Blackfish and the Tully men to go north. Jaime agrees. Brienne tries to return Oathkeeper to him, having fulfilled her promise to Catelyn, but Jaime tells Brienne that it's hers and will always be hers. I think I may have died a little there. ♥♥♥ Even Brienne telling Jaime afterwards that honor would compel her to fight for the Tullys and against Jaime if it came to that can't put a damper on the previous moment for me, LOL. What Brienne didn't quite count on, even after being warned by Jaime, was the Blackfish's tenacity. For a second it looks as though Sansa's letter to him is going to get him to change his mind about holding out at Riverrun, but nope. The Blackfish tells Brienne that he doesn't have enough men to help Sansa take Winterfell, and he's staying to fight for his family home. Cersei enters the throne room with her entourage of Qyburn and Frankengregor for a royal announcement. Ser Kevan blocks her from standing by Tommen and banishes her to the gallery. Tommen's royal announcement turns out to be a ban on trial by combat, which deals a devastating blow to his mother. As they're exiting the throne room, Qyburn tells Cersei that his little birds have investigated the rumor she told him about and found that there's much more to it. So now we all want to know: WHAT RUMOR?! Back in Meereen, Tyrion attempts to get Missandei and Grey Worm to drink and make jokes. Even Grey Worm manages to crack a smile before all three hear an alarm sound. A fleet of ships has arrived, and it's not the Ironborn; these ships bear an image of a harpy on their sails. After having no lines in the previous two episodes he's appeared in, we finally hear Edmure Tully speak again. He asks Jaime how he lives with himself after all the terrible things he's done. Catelyn is mentioned yet again during the conversation, in which Jaime compares Catelyn's love for her children with Cersei's. This scene was actually very powerful until Jaime declared how much he loved Cersei and that he had to take Riverrun to get back to her. No, no, no, no, no! Just no! When we next see Edmure, he's approaching the Riverrun drawbridge and orders it lowered. The Blackfish vehemently argues with a Tully soldier against admitting Edmure into the castle, but as Edmure is Lord of Riverrun, the Blackfish loses this battle. As soon as he's within the walls, Edmure further orders the Tully men to surrender to the Lannisters. Brienne urges the Blackfish to escape with her and Pod, but he refuses and is prepared to die fighting. As Jaime watches Brienne and Pod's boat row away, a Lannister soldier tells Jaime that the Blackfish is dead. I'm a little skeptical of this because we didn't actually see the Blackfish die. Here's hoping that he got away once again. Meereen, including the pyramid, is under attack from the enemy fleet. Grey Worm is mobilizing the Unsullied when they suddenly drop to their knees because Daenerys has returned! And the look on her face! Look who's back—it's Beric Dondarrion and Thoros of Myr! They've been gone since . . . Season 3? Very interesting. Can a certain lady's appearance be far behind? Getting back to the episode, the Hound runs into Beric and Thoros just as they're about to hang the Brotherhood men who evaded the Hound's ax of justice earlier. The Hound, Beric, and Thoros argue about who gets to execute these men, with the Hound being allowed to kill two of them in the end. Beric tries to recruit the Hound for the Brotherhood, mentioning how the cold winds are rising in the north. I'm Arya Stark of Winterfell, and I'm Going Home! It's come to this: one final confrontation between Arya and the Waif. First, though, Lady Crane checks on a sleeping Arya, who wakes up to find the actress dead and the Waif waiting for her. Arya jumps out a second story window. Mind you, she's still recovering from the nasty stab wounds the Waif gave her in last week's episode. A chase ensues through the streets of Braavos. Arya makes another leap and takes a horrible tumble down some stone steps, reopening her wounds in the process. Now bleeding again, Arya can barely walk and is leaving a bloody trail. The Waif doesn't even have to keep pace with her. Ah, but the bloody handprints seem to have been part of Arya's plan to lure the Waif to the tiny room where we previously saw her holed up—and where Needle is stashed. The Waif is all smug, thinking she's about to kill Arya, but Arya draws Needle and cuts off the top half of the candle in the room, plunging them into darkness. Next we're back inside the House of Black and White, and Jaqen follows a blood trail into the Hall of Faces. It's not Arya's face that's been newly added to the collection, though; he sees the Waif's face on the wall instead. Arya points Needle right at Jaqen's heart and gets confirmation from Jaqen that he sent the Waif to kill her. It seems as though Arya has passed the Faceless Men's admission exam, but Arya doesn't want it. She declares that she's Arya Stark of Winterfell, and she's going home! It's the not-to-be-missed Battle of the Bastards! This episode is full of it! The previous one was meh... And yes, what rumour?! I thought I missed out on something but I guess we all did. Jamie and Brienne, they're so cute! Too bad J is In love with C still. Yuck! Danny stole the show and usual and I'm so surprised how Arya survived her stab wounds! Oh well, I guess the Stark reunion is something to look forward to. The rumor is driving me crazy- I need to know what it is NOW! Lol. Daenerys didn't even have any lines, but she definitely stole that scene. I think a lot of us are experiencing a bit of disbelief over how Arya first didn't bleed to death from getting tab and then made two insane jumps AND fell down steps! But obviously I'm happy that she survived all of it, lol. I liked Lady Crane, too bad she bit the dust. I'd like to see a spin off- the Lady crane show or something as they tour the Free Cities ha ha. And "door #2"- lol good one. I was a little surprised that Brienne told Jaime about Sansa trying to retake Winterfell- that's risky because Jaime is an ally of the Freys and Boltons after all. But he doesn't seem inclined to do anything about it, after all he agreed to the proposal which shocked me. That scene where they're rowing away and he waves- that was cool. The RUMOR!! What is it lol? I mostly liked the Edmure/ Jaime exchange, although it would have been nice to have a Tom O' Sevens moment. And Arya... I think we agree, the chase was nice and well done except for the realism of Arya going all parkour with stomach wound! I actually grimaced on that 2nd jump- that looked like it hurt even if she was 100%. I mean she tumbled a ways- dang! Crazy. And Waif was very Terminator- ish- it was almost too much. But a powerful end, definitely. The rumor is killing everyone, lol! Maybe Qyburn has something on the High Sparrow? I'm thinking that it might be something that could help Cersei with her upcoming trial? I liked Lady Crane, too. I'd totally watch a spin-off with the acting troupe! 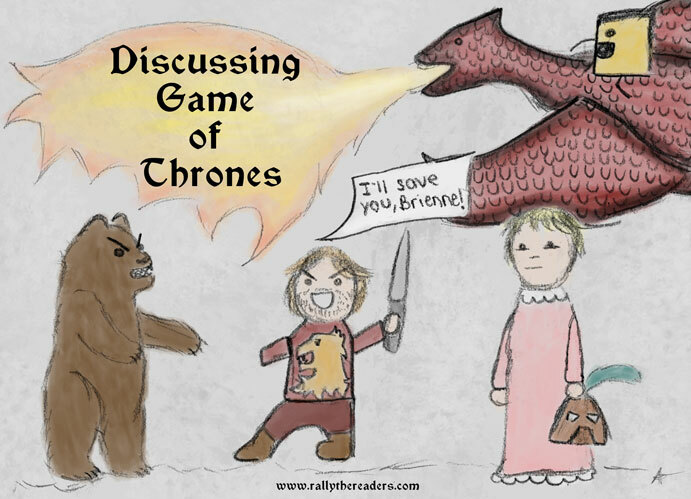 That's a good point about Brienne taking a risk telling Jaime about what's going on up North. I was also surprised that he agreed to let the Blackfish and the Tully men head North if the Blackfish surrendered the castle without bloodshed. He's trying to help the Freys retake Riverrun, yet he'd indirectly aid the Starks? Very interesting. I winced when Arya made the first jump out the window! Even that impact must have hurt, and then she made the second jump and went tumbling right over her wound- yikes! i wonder how long it'll take her to return to Westeros; at the rate all of the other characters seem to be traveling this season, I'd say by the season finale, lol. Super psyched for the battle of the bastards! I was pretty impressed when the Night's Watch fought the Wildlings and then the White Walkers in Hardhome, so if the show runners are promising the most epic battle ever, this should be phenomenal!